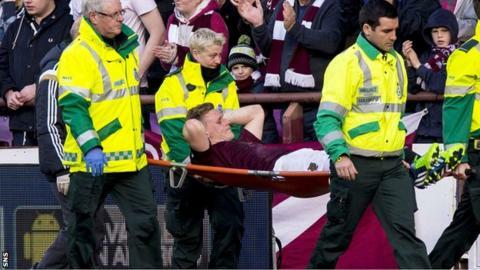 Hearts defender Kevin McHattie will be out for six weeks with a knee injury. The left-back was stretchered off with medial ligament damage following a challenge by Rangers striker Kenny Miller during the 2-0 win on Saturday. Hearts head coach Robbie Neilson had initially thought McHattie, 21, could be out for up to three months. But he told Hearts' website: "It is not good news but it is better than we had feared. We knew it was quite a bad one. No surgery is required, though." McHattie has been advised to rest while his leg is in a brace.